Since ambulance providers are responsible for life-saving medical care at the scene in emergency situations and since response times are important in these situations, it is crucial that ambulances are located in such a way that good coverage is provided throughout the region. 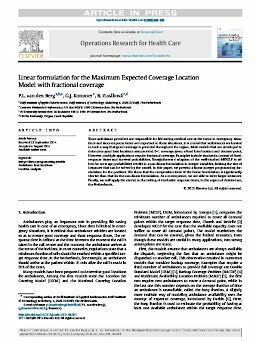 Most models that are developed to determine good base locations assume strict 0-1 coverage given a fixed base location and demand point. However, multiple applications require fractional coverage. Examples include stochastic, instead of fixed, response times and survival probabilities. Straightforward adaption of the well-studied MEXCLP to allow for coverage probabilities results in a non-linear formulation in integer variables, limiting the size of instances that can be solved by the model. In this paper, we present a linear integer programming formulation for the problem. We show that the computation time of the linear formulation is significantly shorter than that for the non-linear formulation. As a consequence, we are able to solve larger instances. Finally, we will apply the model, in the setting of stochastic response times, to the region of Amsterdam, the Netherlands.